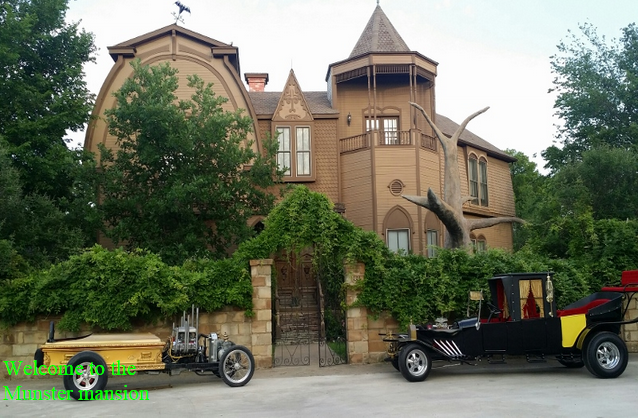 Hey, Dallas/Fort Worth – if you’re looking for something fun to do this Halloween season, how about visiting Munster Mansion in Waxahachie? This home is modeled after 1313 Mockingbird Lane! You can tour the house and party with the owners and Marilyn Munster (Pat Priest), the actress that played Marilyn, will be at the annual party this year! Every year the owners have a Halloween party and this year the proceeds will be going to the Waxahachie Senior Citizen Center. The home tour and costume party will be held October 24th & 25th 2014 from 7p.m. until midnight. Tickets are $20 adults and $12 children 12 and under. Cash only. Tickets are only available at the event and on the night of the event. Food, drinks, and midway games are extra and require tickets which can be purchased along with the home tour tickets. Pat Priest (Marilyn Munster) will be attending to meet her fans, sign autographs (extra fee), and take photos. Park at Finley JR High 2401 Brown ST. Waxahachie, TX. 75165 (www.mapquest.com). Free shuttles to and from the house. Security at the school and house. We will have a booth setup selling Munster’s memorabilia. Knights of the Realm Collectibles (www.knightsoftherealmcollectibles.com) will also have a booth setup selling a variety of toys and autographs. So, make your plans now to attend! For more info check out the Munster Mansion Facebook page and the Munster Mansion website!